The Super RedHawk Alaskan Revolver comes in a stainless finish chambered in .44MAG with a 2.5-inch barrel and black rubber grips. The best revolver you can buy if you are needing something on your side that will pack a punch. Backpack gun for bear country. This is my gun of choice for bear protection. Had one these before. Love the Ruger Alaskan. Now have all three calibers, 480, 454 and 44. Bought the 44 once again because it is the cheapest to shoot a lot at the range. Super revolver. Great price. Thanks again, Grabagun! This is such an amazingly built revolver. I’ve had my eye on this one for 5 years. When I seen GAG had it for less than $850 I jumped on the opportunity. It’s a tank and I love the 44 mag round. Now is the time to buy if you been thinking about this one!! Great gun & great service. I was not certain what to expect from the Alaskan 44. I did exhaustive research prior to purchasing, and read many, many reviews stating to the effect of; 'hold on when firing 44 magnums', "brutal recoil", etc. 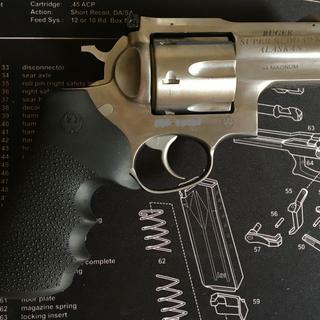 I read several reviews from shooters who claimed that they sold the Alaskan 44 after firing it the first time, and one shooter who only fired two or three rounds before giving up on the gun. I ordered the Alaskan anyway, hoping to get a decent woods gun for camping, something for wild hogs and black bears if ever needed. When I received the Alaskan I found it to be fairly heavy, but not extremely large. Physically it would easily satisfy my needs for a woods gun. I took it out to fire the first rounds through it, fully prepared that this may in fact be my last day on earth, given some of the comment I had read from reviewers. I slowly and steadily squeezed the trigger fully expecting a miniature nuclear blast to occur, wiping out all around it. Would I survive? I am thrilled with the Alaskan 44. It seems that I have found an ideal woods gun for the times that I don't or can't carry a rifle. It seems to be very solid, handles stout loads very well, and should serve me for the remainder of my days. I cannot recommend the Alaskan 44 enough to someone who is looking for such a handgun. I also can highly recommend Grabagun.com, their service was excellent as always. Great gun. Built like a rock. Hogue grip make recoil very manageable. Best price around. This is the second Ruger Alaskan I've purchased. It is a great personal defense gun, as it will stop almost anything that comes for you. There isn't much that could stand up to a 44 Magnum, and the recoil is manageable. This is a classic. Kicks less than a 380 and is a beautiful gun. The Alaskan is my daily carry weapon for defense against a human attacker. I can even conceal it in the summer. How about that? I have had all three caliber Alaskan before. Sold them and recently bought all three calibers once again. Unlike the SW Xframe...comfortable enough to carry all day. I normally carry the 454 for woods protection or the 480. Bought this 44 to shoot at the range. Ammo cheaper. Excellant quality and finish. Just a beefy gun. Excellant service from Grabagun. A great option for bear gun. I purchased this Ruger super redhawk .44 mugnum in 2.5' barrel. For hiking in Bear country. Thank you gragagun.com for a great price. Got The Monkey Off My Back! Just bought the Alaskan, and have not had a chance to shoot it yet. Beautiful gun! I'd been wanting one for a while, and when I saw the price here I knew it was time to commit to buying it. Fastest shipping I have ever seen! I ordered the gun on August 6th, and picked it up from my FFL on the afternoon of August 8th - amazing service! Thanks GrabAGun!! I give the Alaskan 5 stars. It is marketed as a hard hitting, close quarters firearm. At that, it excels. From 21', off hand, shots can be kept within a standard playing card. For practice, .44 SPL's are the way to go. Each trip my Alaskan has taken to the range, 80 to 100 rounds are put through it with no fatigue experienced. When .44 Magnums are used, have a GOOD grip on the pistol. This thing is a beast. I had to adjust the sights a little, but after that it was dead on accurate. The speedloaders I already own for my S&W .44 Magnums work on this gun too. I'm very happy with it.